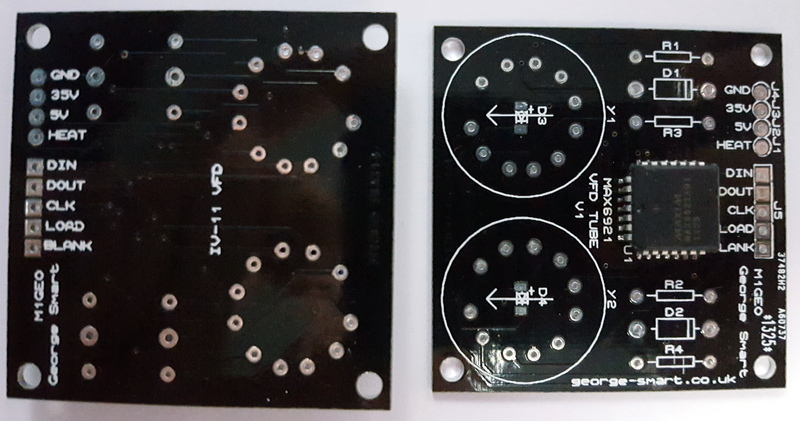 This page details the construction of my MAX6921 VFD GPS Clock. See here for Arduino source code via GitHub. Clock that uses TinyGPS to crack GPS strings and displays the time/date on 6 statically driven VFD tubes via 3 MAX6921s. The MAX6921 Blank line is used to dim the tubes based on an LDR reading. My implementation of this clock uses an Arduino Uno with 3 MAX6921 ICs, each statically driving 2 tubes. These are arranged in 3 multiples of 2 tubes; hours, minutes, seconds. Set by GPS using internal hardware UART and TinyGPS. Temperature and Humidity readings with DHT11 sensor. LDR to sense ambient light and dim tubes at night using PWM via MAX6921 BLANK line. Pulsing decimal points as seconds indicator. Smooth fading on VFDs of seconds indicators and changing between numbers on display. Date displayed each minute (at 47 seconds). Open source hardware and Arduino software – hack to your needs! 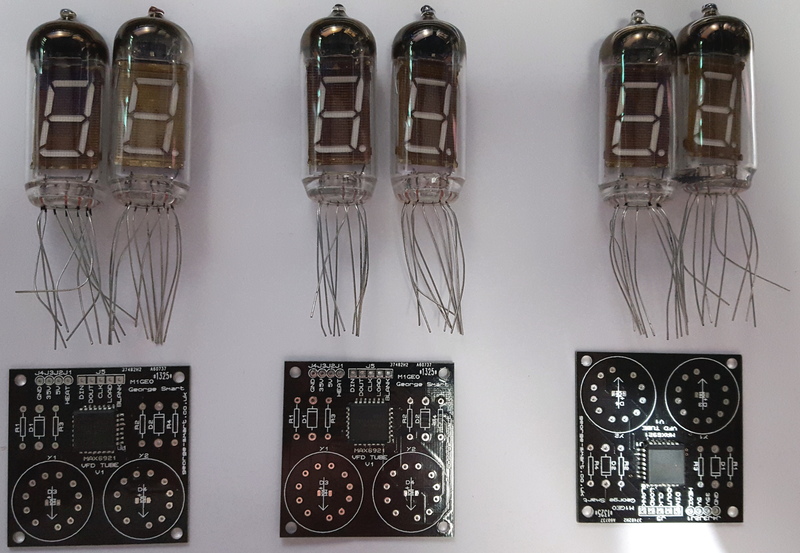 The IV-11 tubes are mounted on a small PCB available here in small quantities for cheap which also holds the MAX6921 and some of the passive components to make the tubes work. You’ll also need a +35V DC supply for the tubes (I used a cheap Â£1 Chinese boost converter, from 12V DC to 35V DC), a logic supply (3V to 5.5V DC), and a heater supply (I used a +5 DC supply from a 7805, which gets warm. Don’t use the Arduino 5V, as the heaters draw too much current, on these tubes, you don’t need an AC heater current). The board will also hold 2 SMT LEDs to underlight the tube. I have used blue LEDs, but any colour will do. There are 3 other components, R1 and R2 are 27 Ohm used to set the heater current (approx 47mA, with 5V DC heater voltage), while R3 and R4 are 10 kOhm used for. D1 and D2 are 1N4148/1N4001 (or almost any other silicon diode which can handle 50mA), and allow the VFD heater to sit slightly above the 0V reference, such that the VFDs are reverse biased with 0V output from the MAX6921, causing the VFDs to be completely blanked (no leakage current) when the segments are turned off (0V). HEAT: heater voltage (5V with current limiting resistor R1/R2 at 27 Ohms). The 12V DC power input from the Arduino power socket. This powers the Arduino. The VIN and GND pins on the Arduino are connected to a 7805 which supplies a +5V DC rail at 1 Amp to the 6 heaters and 3 MAX6921 logic supplies, as well as the boost module, which steps the input voltage up to 35V DC for the VFD Anodes & Grid. These connect directly to the tube boards, all in parallel. The LDR used to measure the ambient light is connected to analogue A0 on the Arduino, with a 10 kOhm resistor to the 5V DC supply. 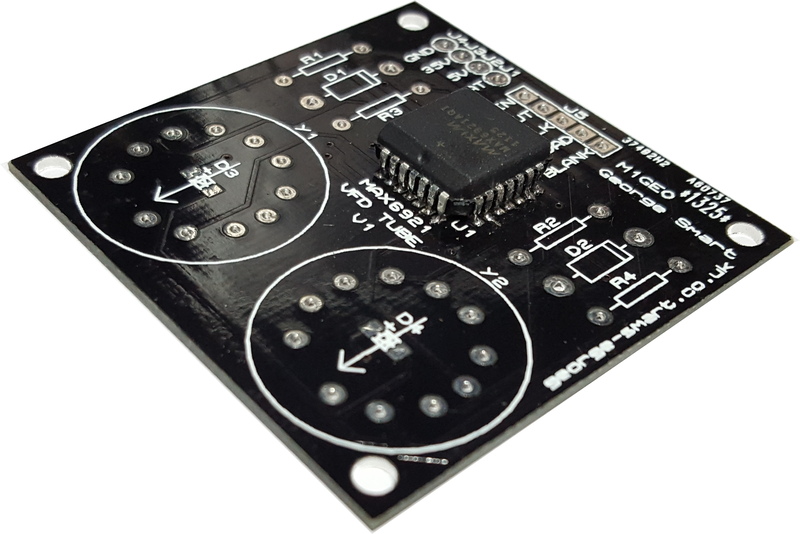 The DHT11 sensor data line connects to Arduino pin 8, if used. The GPS is fed into the Arduino hardware UART on pin 0 (“->RX”). This input must be disconnected to flash the Arduino, as the GPS string would interfere with the incoming firmware. See [http://www.george-smart.co.uk/wiki/VFD_Clock](http://www.george-smart.co.uk/wiki/VFD_Clock) for full project information.